Magic Sand or Space Sand is the closest thing to soil from Mars that we can experience. It is reddish in color and very dusty and dry. The theory is that the sand is called "Hydrophobic Sand," as it has not been exposed to water in over 13 million years! It exhibits hydrophobic properties and is currently being used in NASA Mars Exploration Classroom Experiments. 1. Fill the two cups about 1/4 full of water. 2. Now sprinkle a layer of Magic Sand on the surface of the water. 3. Take a pencil and slowly push it through the layer of Magic Sand. 5. Take the pencil out. 6. Is the pencil wet / dry? Why? 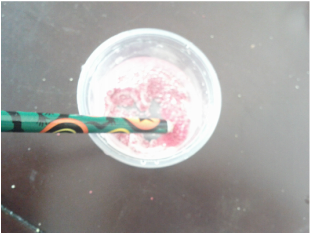 The Magic Sand coats the pencil when it is submerged in the sand layer. As the magic Sand is hydrophobic, or water-fearing, the pencil only comes in contact with the Magic Sand, and remains dry! Experiment II: How do I begin? First toss the water out along with the thin layer of Magic Sand. 2. Add about 1-2 tablespoons of Magic Sand to one cup. 2. Now add 1-2 tablespoons of regular sand to the other cup. 3. Did the Magic Sand get wet? Did the regular sand get wet? Why? Magic Sand never gets wet! Magic Sand has been treated with Silicon vapors. This process changes the chemical composition of the sand's surface and makes it unbondable with water molecules. This property makes the sand hydrophobic or water-fearing. Regular sand sinks to the bottom of the cup once water is added to it. The surface of the grains of sand are wet, so it is bondable with water molecules. This is because regular sand is hydrophilic or water-loving. Magic Sand looks gel-like and some grains float on top.